Ford is unveiling a face-lifted Kuga in Barcelona with its latest technologies including its Sync 3 infotainment system. The Kuga gets new front-end styling with a more heavily sculpted hood. BARCELONA -- Ford and Volvo are using this week's Mobile World Congress in Barcelona as a showcase for their advanced technologies as part of a growing trend for automakers to appear at tech shows in a bid to woo younger buyers. Ford is showing a face-lifted version of its Kuga compact SUV that will now offer the company's latest Sync 3 in-cockpit technology. Volvo will present a keyless car at the show, while Mercedes-Benz Formula 1 driver Lewis Hamilton will appear on a panel with the president of chipmaker Qualcomm. Ford of Europe will launch Sync 3 in its Mondeo midsize car this summer a year before rolling it out to other models, including the Kuga, along with the S-Max and Galaxy large minivans. Sync 3 better connects with the driver’s smartphone compared to the Sync 2 it replaces, Ford said. 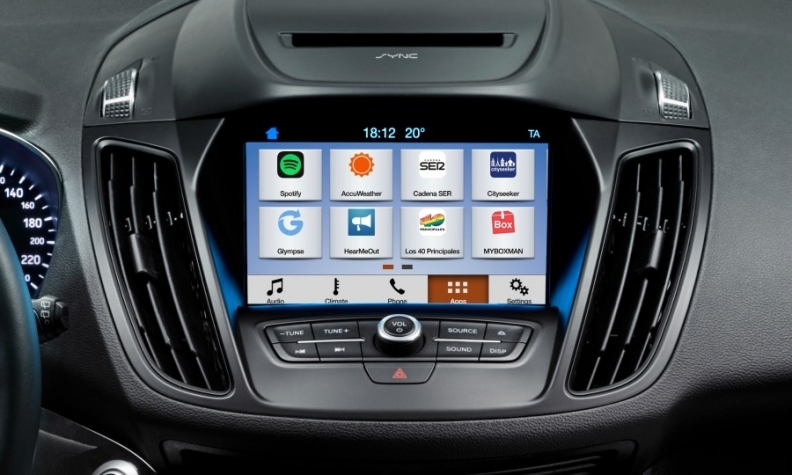 “It enables drivers to communicate with their vehicle and connected devices in seamless ways that would have seemed impossible just a few years ago.” Joe Bakaj, head of product development for Ford of Europe, said in a statement. Ford and other automakers have struggled to keep up with the development of smartphones, frustrating drivers used to the near seamless touchscreen interactivity of their Apple iPhone or Google Android phones. With Sync 3, Ford follows automakers such as the Volkswagen Group by incorporating both Apple CarPlay and Android Auto for the first time. Sync 3's software replicates some of the smartphone functions onto an 8-inch touchscreen. Sync 3 includes pinch and swipe functions for the first time and Ford claims it better understands voice commands to reduce the amount of time drivers spend looking at the screen. Sync 3 will only be available as an option on higher grade Ford models in Europe, but despite that Ford believes 70 percent of customers will choose it for new cars. Drivers can operate Ford Sync 3's 8-inch touchscreen in the same way that they use their smartphones. Ford CEO Mark Fields said 15 million Fords globally have a Sync system and the automaker aims to have it in 43 million vehicles by 2020. "We are transitioning from an auto company to an auto and mobility company," Fields said in a Bloomberg TV interview at the Mobile World Congress. The company is tripling its engineering investment in technologies making cars more semi-autonomous, Fields said. Ford's revised Kuga will also be available with an auto-parking feature that will steer the vehicle into side-by-side parking spaces, as well parallel street parking. Other technology updates on the vehicle include an improvement to Ford’s collision avoidance system that will automatically apply the brakes to avoid an accident at speeds of up to 50kph (31mph), up from 30kph in the current system. The Kuga also gets a downsized 1.5-liter diesel engine that is more fuel efficient than the 1.6-liter diesel in the current model. 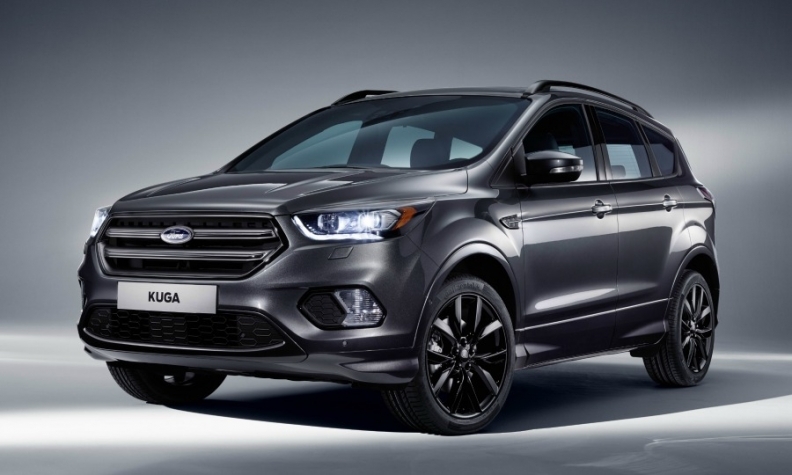 The Kuga is the European version of the Ford Escape, which was shown with its face-lift update at the Los Angeles auto show last year. Both models feature a larger trapezoidal grille to bring it more in line with the styling of the Edge large SUV. The face-lifted Kuga will go on sale in Europe in the autumn. Ford is also outlining in Barcelona its latest plans under the umbrella of Ford Smart Mobility, the company's initiative encompassing areas such as connectivity, autonomous vehicles and big data. Automakers are becoming a familiar sight at tech shows as they seek to win over millennials who may care more about the latest Apple iPhone than a redesigned Mustang. "We see a world where vehicles talk to one another, drivers and vehicles communicate with the city infrastructure to relieve congestion, and people routinely share vehicles or multiple forms of transportation for their daily commute," Ford CEO Mark Fields said in a statement last year. The pivot toward the younger set comes amid competition from Tesla Motors -- which sends automatic software updates to the car's command center -- and a boom in ride-sharing services such as Uber that have left car companies anxious about growth and eager to try out a new crop of digital products and services. "Carmakers have a very narrow window of opportunity to win over Generation Y," said Richard Viereckl, an analyst at PwC in Frankfurt who co-authored a 2015 study on connected cars. "They are at these technology shows to portray their brands as hip, and with mounting competition from the likes of Apple, Panasonic and Sony, they're fighting to keep the attention of and access to their customers." By 2022, 345 million autos worldwide will be connected to the Internet, nearly four times more than last year, according to IHS Automotive. In six years, 98 percent of the cars sold globally will be connected, up from 30 percent last year, the consulting firm said. The trend is driven by customer demand: Three in four consumers said they consider connected car services an important feature in their next vehicle purchase, AT&T and Ericsson said in a report in October. The risk for carmakers is that Apple, Google and Microsoft will conquer the connected-car business with operating systems and apps that people are familiar with. Google and Apple already offer in-car infotainment systems with Apple CarPlay and Android Auto, and Google is at the forefront of developing self-driving cars. "Google and Apple have a good chance as anyone at grabbing the car ecosystem," said Kevin Curran, a computer science professor at Ulster University in Londonderry, Northern Ireland. "Cars today are computers with wheels, and tech companies know that field all too well." To fend off the threat, carmakers are set to make "big decisions" over the next 24 months, striking cooperation pacts and increasing spending on research and development as well as M&A to get ahead, said Thilo Koslowski, who heads the auto practice at researcher Gartner. Those who don't are at risk of being left behind, he said. Automakers face a tough challenge contending with fleet-footed tech companies. The disruption brought by the connected car is similar to what happened 100 years ago, when the automobile successfully challenged the horse and carriage industry, Koslowski said. Engineering excellence isn't enough anymore, but to appeal to the next generation of buyers a carmaker needs to show how it can enrich a consumer's digital lifestyle, he said. "Automakers have an opportunity to make cars even more compelling and spark a renaissance of the car," Koslowski said. "They are being challenged and they have to be careful that they don't turn into a horse and carriage industry." General Motors debuted its Chevrolet Bolt electric car at the Consumer Electronics Show in Las Vegas in January, before taking it to the Detroit auto show a week later. Such moves are aimed at highlighting vehicles' software and Web features, with carmakers adding iPad-like dashboard touch screens and moving beyond to even more futuristic systems. German automakers BMW, Audi and Daimler last year teamed up to buy Nokia Oyj's HERE map business, a response to Google and Apple. BMW's iDrive system brings apps, radio and navigation to the dashboard, reducing knobs and buttons for a user experience that's closer to that of a smartphone. Porsche's Mission E concept car unveiled last year features eye-tracking and gesture-control functions, which include holograms that allow the driver to grab apps out of the air.